Thanksgiving is almost here! It’s time to come together as a family, eat a lot of food, watch a lot of football, and appreciate what you have to be thankful for. One other Thanksgiving tradition to get excited about is getting to see all of the Christmas light displays in Kansas City go up! Christmas lights in Kansas City can be beautiful, and there is no better way to end your Thanksgiving vacation with your loved ones by appreciating all of newly installed Christmas lights and decorations. Here are some of the best ways to enjoy beautiful displays of Christmas Lights in Kansas City! People tend to be eager to begin Christmas light installation in Kansas City the moment summer ends, and fall begins, but a lot of homeowners wait to call their Christmas light installer in Kansas City until after Thanksgiving. After a filling Thanksgiving meal, taking a drive around the beautiful neighborhoods of Kansas City will lend to the enjoyment of beautiful Christmas light displays. Before beginning your own holiday light installation in Kansas City, take a drive around your neighborhood to get inspiration. You could have the most beautiful house of all this year! The Plaza is another great place to enjoy beautiful Christmas light decorations in Kansas City following your Thanksgiving festivities. Christmas light installers in Kansas City don’t hold back when decoration the Plaza. Not only are the lights beautiful, but they are also inspiring. From the street lamps to the storefronts, the Plaza is a great place to view Christmas light displays. Take inspiration from this professional display, and call a professional Christmas light installer in Kansas City for your home as well. When it comes to Christmas lights, we always seem to want more! There are so many beautiful places to enjoy Christmas light displays in Kansas City. Not only are there beautiful Christmas light displays surrounding your own home following Thanksgiving, but also all over downtown Kansas City. Don’t settle this year, call a professional Christmas light installer today, and make your house the brightest, most beautiful display of holiday cheer around! Explore Kansas City this Thanksgiving season, and see what Christmas light displays are already set up. Tis the season for lights! As one of best lighting companies in Kansas City, it’s always fun driving around during the holiday season and looking at the Christmas lights on display. Brainstorming for your home’s Christmas light display next year is still a great holiday tradition and fun for the entire family. More than ever, people are requesting LED Christmas lights on the outside of their house because they are efficient, use less electricity, and are truly beautiful. 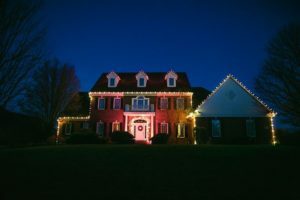 Here are 5 tips when selecting Christmas lights for your home from your trusted Kansas City lighting company! Choosing between Christmas light colors can be fun for the entire family! Some houses look great in all white; some look great in a classic red and green, while others like a variety. Bring your family together this holiday season, and choose your new Kansas City Christmas lights together! Christmas and holiday lights come in all shapes and sizes. Having such a large variety can add to the fun for the whole family! LED C9 lights are typically used for houses, while C7 lights generally are used for trees and other outdoor landscaping. Keep your home shining bright this holiday season! There are many different styles, designs, and looks available for your holiday lighting display. There are many different styles of ceramic looking LED Christmas light bulbs that can be arranged for multicolor and single color displays. Contact your lighting specialist today! While multi-colored Christmas light displays are fashionable and beautiful, so are single-colored Christmas light displays. Consider going monochromatic this year with a blue-only display, or even green or red. Selecting the perfect color strand wire is extremely important for your Kanas City lighting display this Christmas season. White wire strands may be ideal for indoor lighting displays, but not always for outdoor lighting displays. Green strands are what the professionals use, so contact your trusted Kansas City lighting specialist today about what strands will work best for your home. All five tips are essential things to consider when working with your trusted Christmas lighting installation crew. Your next Christmas light display could be the best in the neighborhood, so bring in a trusted professional. TRANSFORM YOUR PROPERTY INTO A WORK OF ARTOur reputation for creating breathtaking lighting solutions transforms our customer’s properties into amazing works of art. This innovation distinguishes us as a true leader in the landscape lighting industry. Let us show you how by scheduling a no-cost consultation and demo. Our customers love what we do, and so will you! Call (913) 851-5882, or visit https://bit.ly/2pkvNif to schedule your discount today! Tired of Silly Marketing to get Your Attention and Business? In today’s world of nonstop marketing, commercials, and pop-up ads, it can be enough to make your head spin. This week, I saw an ad that made my head shake in utter shock and awe. Allow me to disclose my bias in this article … I am an owner of an outdoor landscape lighting company. We like to think we are the best landscape lighting company in Kansas City. When it gets too cold to do outdoor landscape lighting, we turn to our other passion: corporate and residential Christmas lighting. I guess you could say we love lights here at CLC Services. Check out our work. Now, on to what motivated this blog … I was watching TV the other night, and a company most of you have heard of (that will remain nameless) was running a commercial for motion-detecting flood lights that you can mount on the front, side, or back of your home. In the “B” roll footage, they showed several scenes of an intruder dressed in all black making his way to the front door and all the way to the back door, when all of the sudden, this light popped on, saving the day and scaring the would-be intruder away! This may seem like a victory, but I lost my mind. Why in the world would you create an inviting environment for a burglar to get so close to your door in the first place? Behind that door lies everything you care about! Why become the target in the first place? Not trying to scare anyone, but a burglary happens every 15 seconds in the United States. Most burglars avoid houses with lights, as their goal is to avoid unwanted attention. Wouldn’t it make more sense, and be much safer, to create a well-lit environment with LED landscape lights? Creating a well-lit environment that would make a burglar think twice for fear that someone could identify them later? Simply put: lights and burglars don’t mix. CLC-Services can help solve this problem permanently. Let a local Kansas City landscape lighting expert light up your house with low-cost, no maintenance, lifetime warranty landscape lights. We can design a no-obligation, try-before-you-buy light layout, which not only will be visually beautiful and appealing, but will thwart would-be intruders from even thinking about getting close to your entry doors. To my faithful readership, sorry if this was darker than our usual posts. This is a subject close to home, and it just got under my skin when I saw a company advertising a motion sensor that doesn’t prevent your house from being a target in the first place. Having a motion sensor is better than nothing and, if we are dealing with a smart burglar, they will move to the next house once the light turns on. If we are dealing with a really bright burglar, they just may use that exact same motion light to test to see if it draws attention. A huge thank you for taking the time to read our blog. We hope it helped answer any questions you had. Feel free to reach out to with any additional questions you may have. You can call us at 913.851.5882. This week in the Kansas City Landscaping Lighting Blog, CLC Landscape Lighting would like to talk about how to change a gas light to a LED light. Gas exterior lantern style lights are beautiful; however, they are not without problems. The great news is that there are companies that make gas light conversion kits, allowing us the ability to take your current gas light fixture and remove the internal gas fixture and replace it with an identical LED version. This is really quite incredible. The cost savings to run the LED lights instead of gas could be as high as 90%! LED lights also use around 75% less electricity then a typical incandescent bulb. These LED bulbs are rated for around 50,000 hours. That is equivalent to around 15 years of trouble-free use. You can use the LED light fixture just as you would your gas fixture by running your LED lights nonstop, with minimal cost. We think of ourselves as the best landscape lighting company in Kansas City, and we like to go above and beyond for us customers. We would recommend adding a timer or a dusk-to-dawn photo cell to the fixture so your lights come on automatically, saving you money while still maintaining that beautiful gas light look at dusk. Maybe the most common issue we face with gas lighting living here in the Midwest and planning landscape lighting in Kansas City is that we have high winds with our weather. High winds can blow out the gas lights, causing maintenance issues for homeowners. LED lighting, unlike gas, won’t be blown out and takes one less worry off the homeowner during the storm. While we know the issues we have brought to attention today are not the end of the world, we do hope they provided some additional information between the differences between gas and LED lighting. When it comes to saving money and time, that is always something we bring to light here at CLC Landscape Lighting. 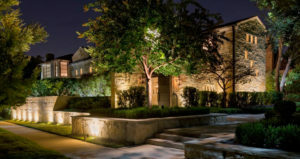 Remember at CLC Landscape Lighting, we offer a full line of landscape lighting in Kansas City. The first step to a beautiful outdoor area is calling us for a free consultation. Our expertise goes from gas light conversation to pathway lighting to a full immersive experience in your outdoor living space. A huge thank you for taking the time to read our blog. We hope it helped answer any questions you had. Feel free to reach out with any additional questions you may have. You can reach us at 913.851.5882. As the spring months of April and May approach in Kansas City, it often leads to excitement, as well as a sense accomplishment for graduating seniors, in both high school and college. It also leads to new beginnings, both in landscape and life. Flowers are beginning to bloom, trees as well. Just like the ideas for the future that you or your loved one have in mind. There’s so much to do; a special gathering must be organized. Friends, family, neighbors … everyone who watched you grow up or held a special place in your heart will certainly be invited. Cards, gifts, food, tables, chairs, balloons, even a DJ or band are all items that will certainly be considered for all the ingredients for a successful graduation party. Considering most parties in the spring are held in a backyard, outdoor living area, or on a deck, your guests are certain to make their way outside to the inviting spring air and warmth. Don’t forget an unsung hero or forgotten key to a great party, ambiance, and overall good feeling … landscape/party lights. Trust CLC-Services Landscape Lighting to string something up temporarily or more permanent. If you entertain outside often, perhaps a more permanent option would suit you best. CLC-Services offers straight, White landscape light options or colors such as Red, Green, Blue landscape lights (RGB) which gives you the ability to dim or change the lights to any color you could possibly dream up—over 33,000 colors to choose from. This is the perfect opportunity to have your outdoor landscape lights turned to the team colors of the school in which you graduated. The options are not just limited to your favorite schools. The Kansas City Royals’ and Chiefs’ colors can be used on game days as well. Just some things to consider as you plan the perfect party. Let the Kansas City landscape lighting experts help you with this important ingredient: lights! Call today for a free consultation.